About a year or so ago, a new restaurant opened up in our neighborhood. This is a space that I remember a restaurant having been in since I was a kid. When I was growing up, this space housed a Sizzler, which was quite popular. As the years went on, the Sizzler started to fall out of favor, and the restaurant had less and less customers until the Sizzler closed. Since I was a teenager, the space has seen quite a few restaurants that have come and gone for one reason or another. So, it wasn’t that big of a deal when the last restaurant closed and a new one took its place. My husband and I figured that before long, this new restaurant would also shutter it’s doors. But, then we started noticing something we hadn’t seen with any of the previous tenants of this space, every time we drove by, no matter the day of the week or the time of day, the place always looked busy. That must be a good sign. Then I talked to a couple of friends who tried out the restaurant and they said they liked it. Not too long after that, I read a little blurb in a local newspaper about how nice it was to have a good quality restaurant in our neighborhood that is mainly made up of chain restaurants. After all of the positive reviews, my husband and I decided it was probably time to give this restaurant a try. Reunion Kitchen + Drink is a full service restaurant and bar. Specializing in what they call “modern comfort” you’re greeted by a full service bar in one half of the restaurant and an intimate dining space defined by high back booths with an open “exhibition” kitchen in the back of the restaurant. Off to the side, there is more casual table seating with large screen televisions within view to create more of a home living room setting showing the local sports teams. And on a nice day, which most days in the area are, there’s plenty of outdoor patio seating as well. 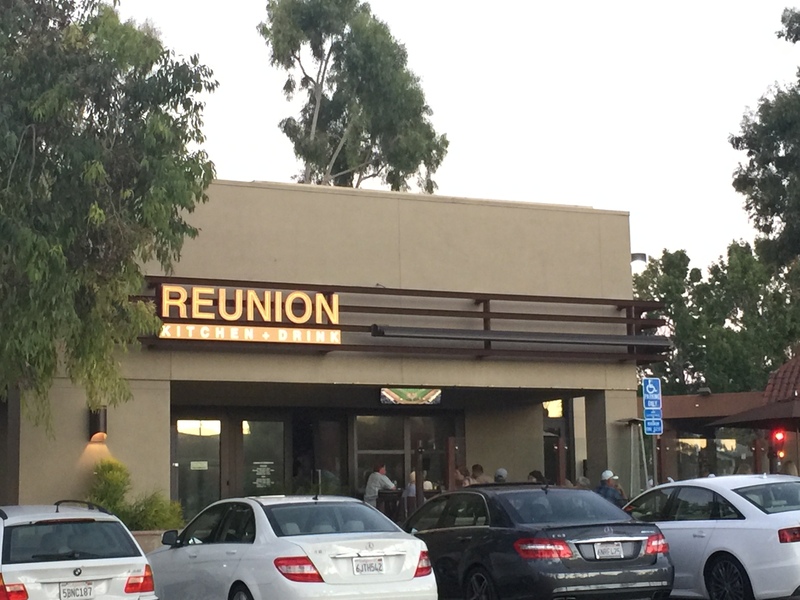 Reunion Kitchen + Drink offers up hand crafted cocktails and beers on tap featuring plenty of local brews. 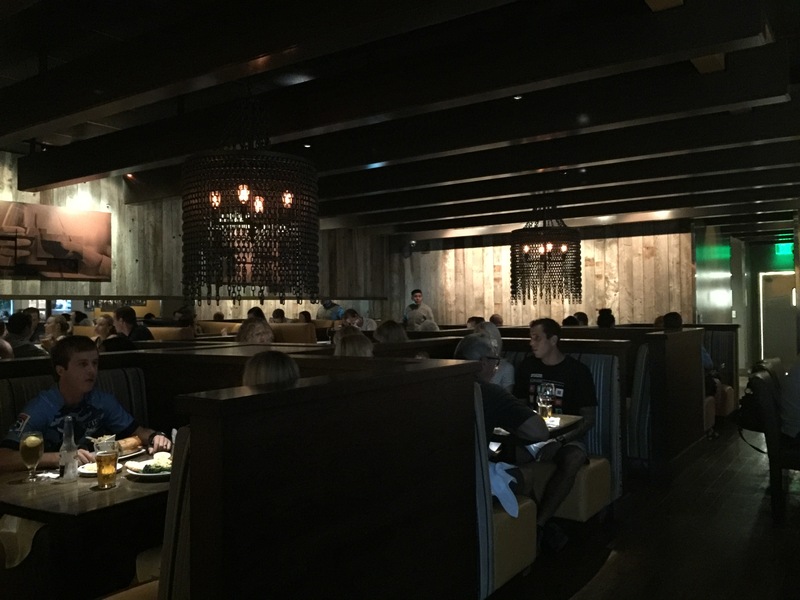 The kitchen offers up a full serving of soups, salads, sandwiches and entrees that are modern twists on classic American comfort food dishes. There’s a little bit here for everyone to enjoy. One of the things on the menu that really caught my husband’s eye, and convinced him to come and try Reunion Kitchen + Drink wasn’t a menu item per se, but a drink offering. A couple of years ago, my husband discovered a Belgian beer that he fell in love with. 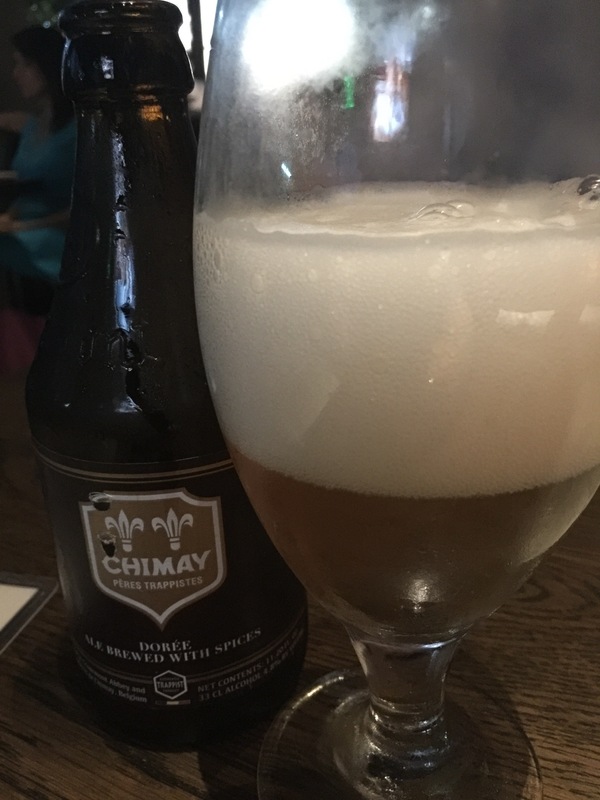 And since that day, whenever we’ve been anywhere, especially when we traveled in Belgium, where they served Chimay, no matter what kind of Chimay, my husband always orders it. Here at Reunion Kitchen + Drink, they were offering Chimay Doree Gold which my husband had never seen or heard of before. Turns out that the bar manager who later came over to our table told us that they only started bottling Doree Gold 6 months prior to our visit. Before then, the monks who produce Chimay only offered Doree Gold as a special brew served at the moastery to whose who went and visited. My husband loved the flavor of Doree Gold as it’s described as being an ale made with spices. He said it was really tasty and somehow reminded him of his younger years when he used to drink more in the sense that it was so tasty it made it easy to drink and you could easily just start pounding these. Of course, being a Belgian beer, it has a higher than average alcohol content, so pounding these things is probably not the brightest idea. We started our meal getting an order of the loaded potato skins. Using potatoes from Penobscot, Maine, the skins are loaded with cheddar cheese, bacon, green onions and served with a sour cream chive dip on the side. The skins were really crispy on the outside and super tender and fluffy potatoes on the inside, which is good. The quick deep fry created a crunchy exterior which added texture to the skins was a perfect vehicle to melt cheese onto. 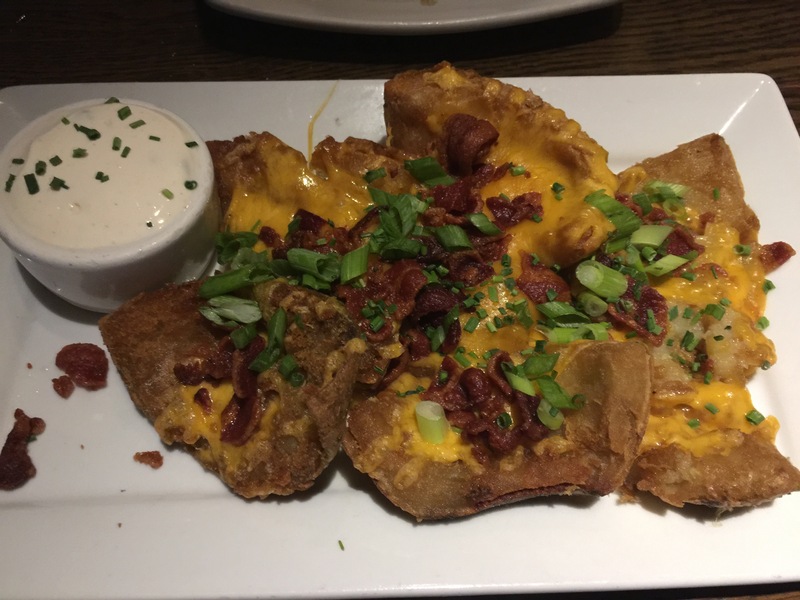 The potato skins were terrific in flavor, not too salty, as sometimes they can be when loaded with cheese and bacon, and they weren’t too over-flavored either. In this case, you can taste every ingredient in the potato skin as you’re enjoying it, and the subtle onion flavor of the green onion works well. 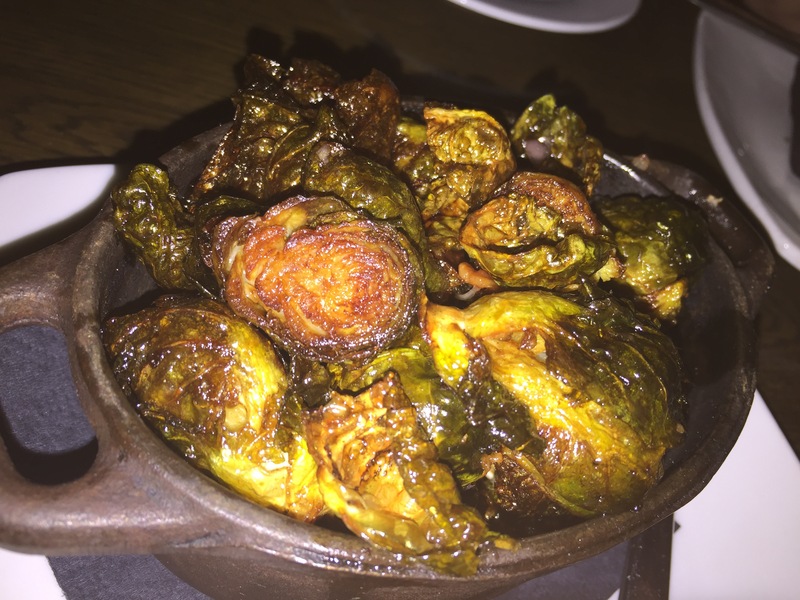 We also decided to get an order of the Brussel sprouts. Roasted with cider vinegar, bacon, maple syrup and shallots, the sprouts were tasty! Roasting the sprouts creates nice caramelized sprouts with some crispy outside leaves, but the inside of the sprouts are tender and soft. The cider vinegar adds a great bite of tang to the sprouts and balances out the salty bacon. The addition of maple syrup is nice as it adds sweetness and helps in caramelizing the sprouts through the roasting process and then you’ve got the shallots with their hint of subtle onion flavor that helps to round out the flavor of the dish. I think I enjoyed this dish more than my husband did, but that’s not surprising. I pretty much ordered this dish for myself. 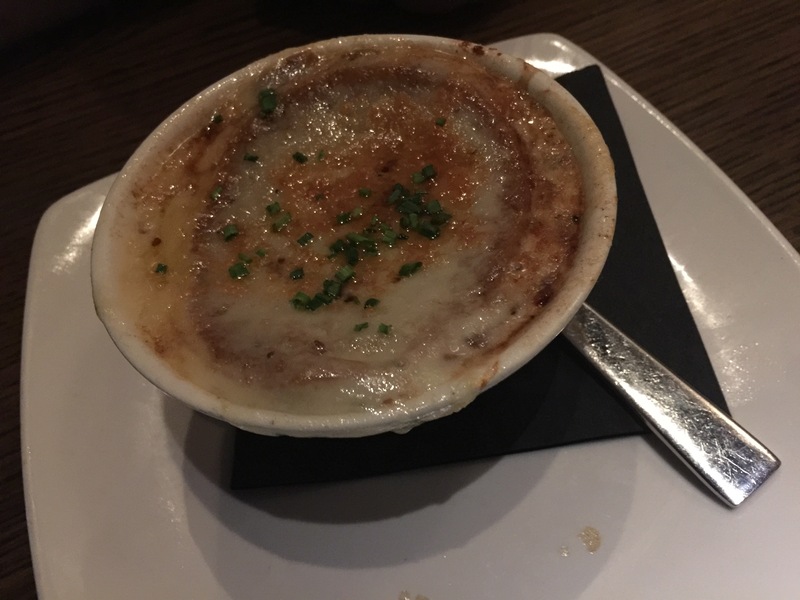 As if we hadn’t had enough appetizers, my husband decided he wanted to get a cup of the French onion soup to go with his meal. He just can’t resist the cheesy goodness of French onion soup. He thought that the soup had great onion flavor, but wasn’t salty as French onion soup has a tendency to be. The cheese had a terrific nutty flavor which balanced out the onions and the broth. My husband also mentioned that the soup was at a perfect temperature. My husband is picky when it comes to hot items, he doesn’t like his food too hot or else it burns his mouth and he loses the flavor of the food. In this case, he thought that the soup was a nice warm temperature that he could immediately enjoy it without burning his mouth or having to let the soup sit to cool down. 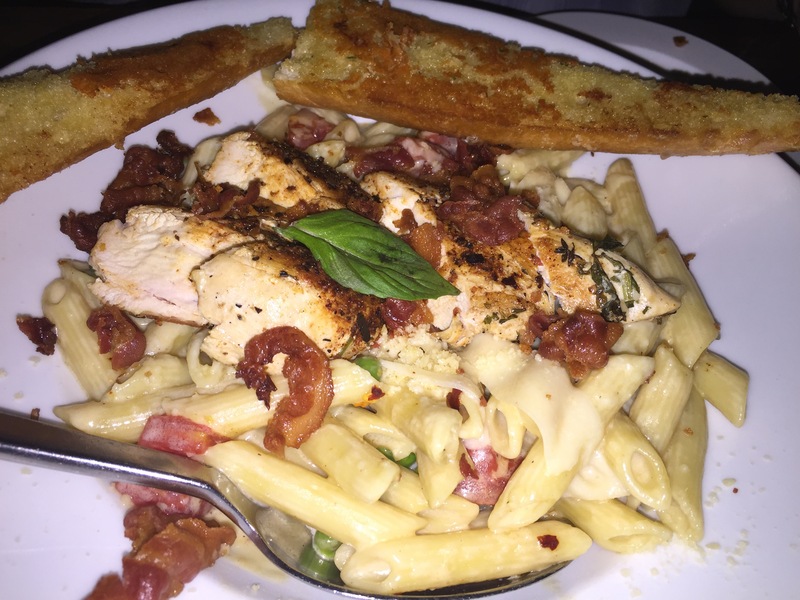 For dinner, my husband ordered the crispy pancetta pasta with blackened chicken. Made with penne pasta, tomato, fresh basil, garlic cream, baby peas and fresh parmesan, and served with a couple of slices of garlic toast, my husband really enjoyed his meal. The garlic cream sauce was delicious and cheese. The crispy pancetta had a nice salty taste to it, the blackened chicken was flavorful and filling, and the tomatoes and fresh basil added a nice fresh flavor and touch to the dish. The garlic toast was a terrific accompaniment to the pasta and the baby peas added just another element of flavor, one my husband would never get at home because I absolutely hate peas. This pasta dish was incredibly filling and there was a lot of it. No matter how hungry my husband was, he just couldn’t finish the dish. 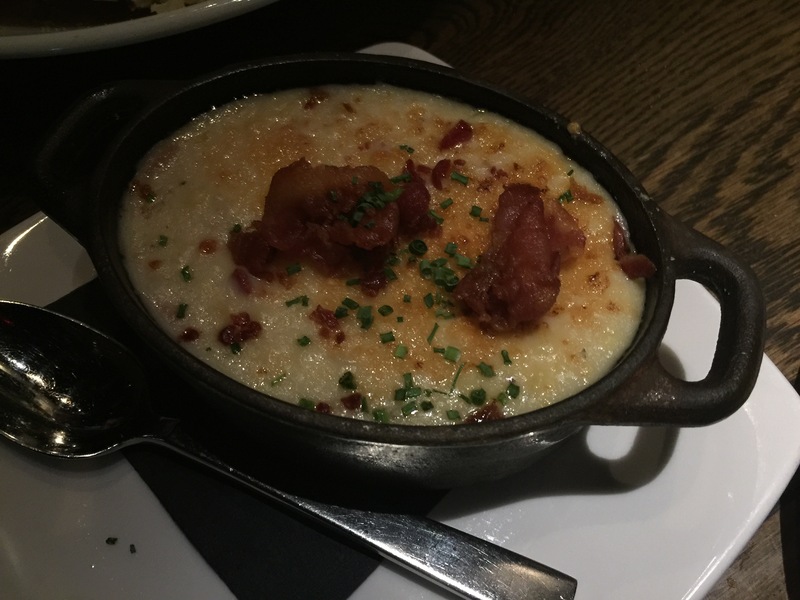 As a side dish to our meal, I ordered the creamed corn with bacon. I’m a huge fan of creamed corn, and though my husband doesn’t really enjoy it, I try to order it whenever I see it on a restaurant menu. For me, creamed corn is one of those throwback dishes that I feel like you just never find anymore and I love it when I find a restaurant that actually serves it. I loved the crispy bacon topping the creamed corn as it added crunch but also a bite of saltiness to the dish. The creamed corn was extremely creamy and full of great flavor. My only complaint would be that there was a lot of cream, and didn’t seem to be enough corn kernels and I definitely would have liked it to have just a bit more corn in the creamed corn. I chose the slow braised short ribs for my meal. Made with a rich demi glace, horseradish cream and served over mashed potatoes with a side of roasted vegetables, the short ribs were then topped with firestick onions. First off, this dish was huge! Much like my husband’s pasta dish, this dish made me full just looking at it because it was potatoes piled high with short ribs, with vegetables with crispy onion straws. It was crazy. But, it was so good. The potatoes were nice and creamy and a great side to the short ribs. The short ribs were fork tender and fall apart and there was so much short rib. They certainly didn’t skimp on the meat. The horseradish cream sauce was terrific, with a nice finishing horseradish bite that really stood out from the rest of the flavors on the plate. The roasted zucchini was fantastic with still a little bit of crunch and was a perfect side for the potatoes and ribs. And I loved the topping of the crispy firestick onions, not only did they add some flavor to the rich short ribs, but they also added texture and crunch to the dish as well. Even though neither my husband nor I could finish our meals we couldn’t help but take a peek at the dessert menu. Our waiter pointed out to us what he said was the best and most popular dessert on the menu and we thought, “what the heck?” So we decided to split the warm butter cake. Made with a house secret recipe, it is topped with a scoop of vanilla bean ice cream, raspberry puree and finished with fresh whipped cream. Oh my! This butter cake was rich and butter, but not over-the-top. 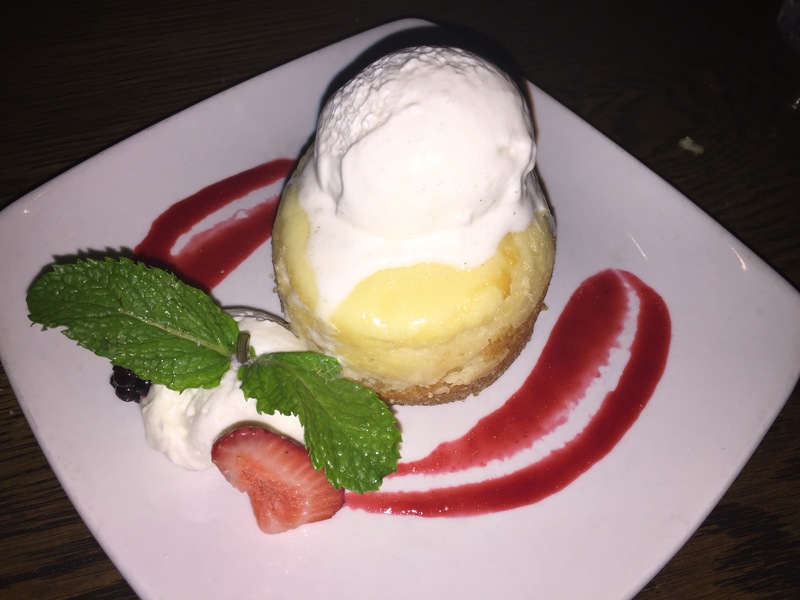 The combination of the warm butter cake and the melting vanilla bean ice cream was perfect and the ice cream helped to cut out some of the richness of the cake. But the butter cake was certainly the star, it was moist and flaky and perfectly baked. The raspberry puree added a nice acidic punch to the dessert and helped balance out the flavors and the homemade whipped cream added a refreshing creaminess to the rich cake. I was stuffed by the end of the dessert, but I was glad we decided to split this as it would have been a shame to miss out on it. After waiting so long to eat at Reunion Kitchen + Drink, we couldn’t figure out why we hadn’t decided to try it earlier. The place was jam-packed on the Saturday night that we went there, and it always seems to be packed every time we drive by it. That’s a great testament to the delicious food that’s being served up inside. 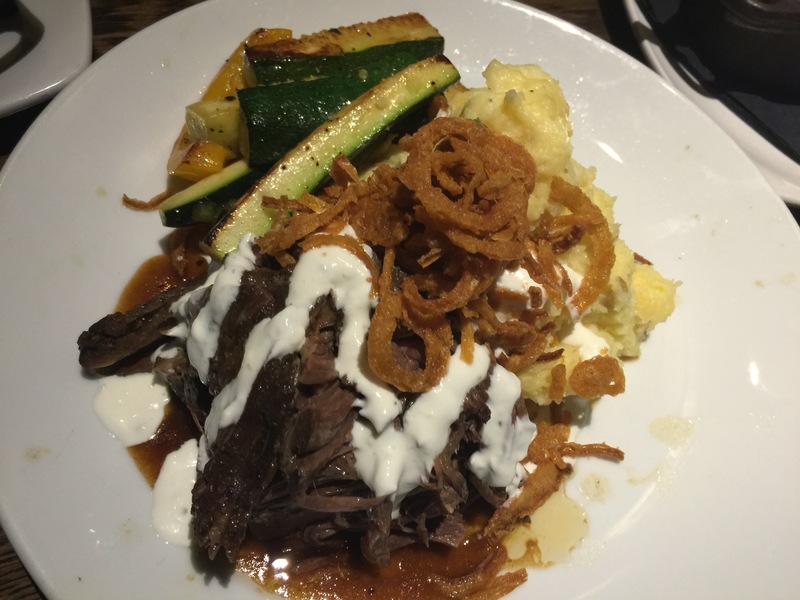 Modern comfort food is a great way to describe the eclectic menu, and even our orders reflected modern comfort food from old fashioned creamed corn to short ribs and pasta with cream sauce. My husband loved that they were serving a variety of his favorite beer that he hadn’t ever tried before and our finishing dessert was a great way to end the meal. We’ve since been back to Reunion Kitchen + Drink since this first visit, and I’m sure there will be more future visits to come.